Training samples are created to represent classes in a supervised classification. Different classes should be separated in the multidimensional attribute space. If any of them are overlapping, you might consider merging them into one class. To check the separability and distribution of your training samples, Training Sample Manager provides three evaluation tools: a Histograms window, a Scatterplots window, and a Statistics window. These tools are accessible as buttons on the manager. The Histograms window allows you to compare the distribution of multiple training samples. If the training samples represent different classes, their histograms should not overlap each other. To compare the distributions of two or more training samples, select their classes in Training Sample Manager and click the Histograms button . The color of the histogram matches the color of the class in Training Sample Manager. The Histograms window contains the same number of graphs as the number of bands in the image layer. This window displays four graphs in one screen. If you have more than four bands in the image layer (which means there are more than four graphs), a vertical scrollbar will be available. This tool works for integer images only. If the image data is stored as floating point, the Histograms button will be unavailable on Training Sample Manager. 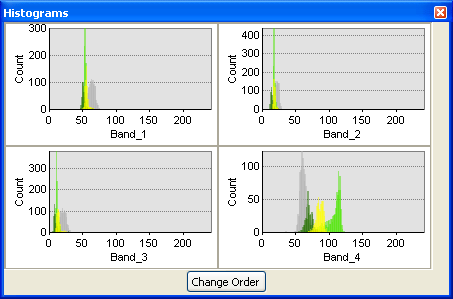 The Change Order button (located at the bottom of the window) allows you to change the overlapping order of the histogram series. If a class is hidden in the background in one or more histograms, you can bring it to the foreground by clicking on this button. The Scatterplots window is another way to compare multiple training samples. If the training samples represent different classes, their scatterplots should not overlap. To compare the distributions of two or more training samples, select the classes represented by the training samples in Training Sample Manager and click the Scatterplots button . The color of the scatterplot matches the color of the class in Training Sample Manager. There is one scatterplot for each unique band combination of the image layer. For an n-band image, there are 1 + 2 + … + (n – 1) scatterplots. For example, there are six scatterplots for a four-band image. This window displays four graphs in one screen. If you have more than four bands in the image layer (which means there are more than four scatterplot graphs), a vertical scrollbar will be available. The tool works for both integer and floating-point images. 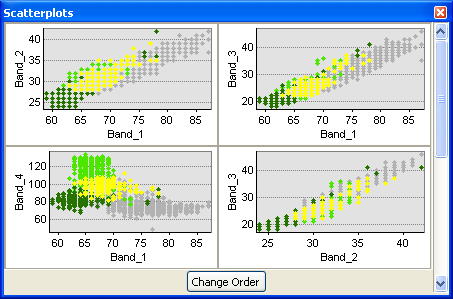 The Change Order button (located at the bottom of the window) allows you to change the overlapping order of the scatterplot series. If a class is hidden in the background in one or more scatterplots, you can bring it to the foreground by clicking on this button. 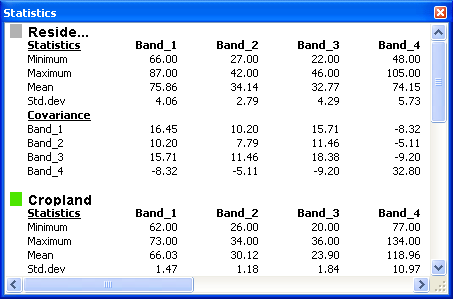 The Statistics window displays the statistics for the selected classes. To view the statistics of one or more training samples, select the classes in Training Sample Manager and click the Statistics button . The available statistics include minimum values, maximum values, means, standard deviations, and a covariance matrix. The text in the Statistics window can be copied to the Windows clipboard by pressing Ctrl+C.